We get a lot of questions about bunny-proofing. What is it, and what kinds of things do you look for? When you bunny-proof, you are making a safe space for your companion rabbit to live and play. You want to look for any hazards that they can get into, as well as things in your home that you want to protect. Some examples of things you want to bunny-proof are electrical cords, plants, furniture, and carpet. Bunnies love electrical cords. Phone chargers and earphones are common casualties of bunny teeth, but lamp and computer cords are also fair game. Bunnies can be seriously injured by biting through a cord, so it’s important to protect them. The most common ways to bunny-proof cords are to either cover them, or make them inaccessible in some way. Plumbing tubing makes a great, and inexpensive cord cover. You can find it at the hardware store in a variety of sizes, and it’s easy to cut to the length that you need. To use it, split the tubing with a knife, put the cord(s) inside, and seal the ends with clear tape. Other options for cord covers are the hard plastic ones that run along baseboards. They usually come in white or black, and can be fixed to the wall. For computer cords, cord clips or velcro straps can easily be fixed to the bottom of a desk or shelf. They secure the cords and keep them out of reach. You can also use the wire baskets made to attach to the bottom of a desk . For larger items, like power supplies, you can build your own cord stand from wire shelf grids and zip ties, and then place the power source inside. It’s a common misconception that a house rabbit will avoid a poisonous plant. 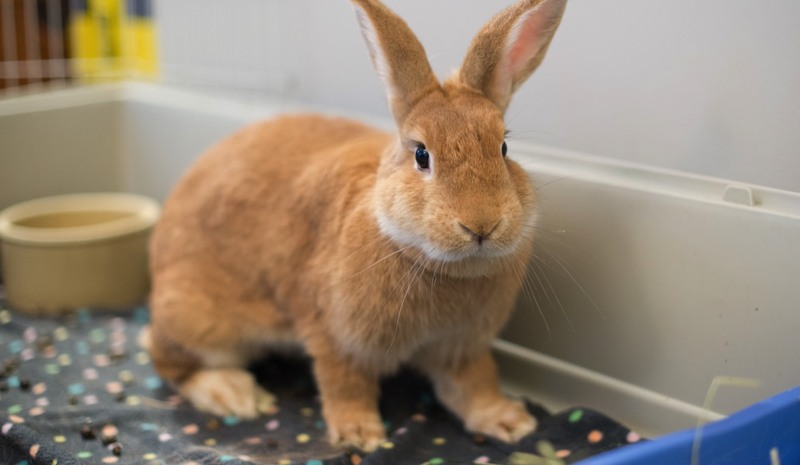 Domestic rabbits do not learn from their mother which plants are safe and which are toxic, like wild bunnies might outside, and a domestic rabbit will eat a plant that is poisonous to them. Most common houseplants are toxic to rabbits, so it’s important to move any plants to an area where bunnies do not go. For adventurous bunnies that like to climb on furniture, moving them to a table or shelf may not be enough, and leaves that fall off the plants are also a potential hazard. Trading your tropical houseplants for bunny-friendly herbs is a good option for people who enjoy plants in their home. Some bunnies love to chew furniture and baseboards. They may be attracted to a certain piece because of it’s shape or material, or they may decide any furniture will do. You can protect your furniture during playtime by blocking it off with fences or gates. The fences are lightweight and fold away, so you can store them when they are not in use. Remember to give your bunny lots of things that are healthy and safe to chew. Having safe toys not only provides enrichment, it also can help save your furniture. Some bunnies love to dig the carpet. Corners are especially attractive, but fortunately they are easiest to protect. A 12x12 inch tile from the hardware store is an inexpensive way to prevent corner carpet digging. The tiles come in lots of styles and colors, so it’s easy to find something that matches your home and doesn’t make your friends think you gave up halfway through a home improvement project. As a bonus, bunnies like to lay on the tiles to stay cool.